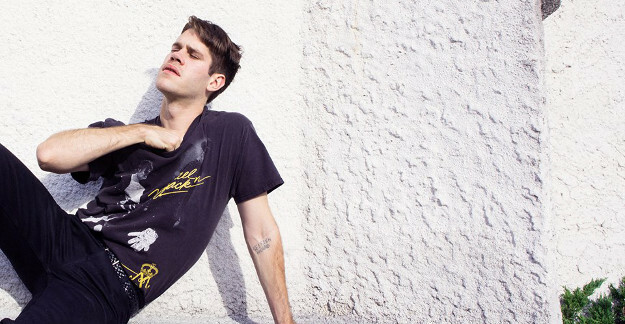 Porches is the folk-y eccentro-pop* project of Aaron Maine. He also drums in Frankie Cosmos. But this is neither the time nor the place to discuss that band. Been there! Done that! Listen up now. Let's get serious. If you like your strong singer-songwriter rock twinged with a little world weariness and some slightly psych-y darkness, then, pardner, you should consider getting into this goodness. When I recently saw Porches play a big space to mostly-harried shoppers of locally grown trinkets (it was at something called a night market! a flea market in the evening! wow! mint! rare!) you could tell that not everyone in the room got it. Most were too busy trying to find good deals on cool alt reading glasses and hand woven afghans made of kale. But those who did get it were really feeling and digging and grooving on Aaron Maine and his band, man. 2-3 rows deep around the stage felt like a cult worshiping its personality, performing in the flesh with the body and by the blood. If he had handed out Kool-Aid at the end, I bet some people would've drunk it. Hell, I might've too. But I was full up on beer. The always excellent Exploding In Sound Records (Ovlov + Grass is Green + Krill + Palehound + lots) released Porches' recent full-length “Slow Dance in the Cosmos." Some of the song titles are “Jesus Universe" and “The Cosmos" and “After Glow" and “Fog Dog." Whoa. You should listen to it in its entirety below. Because it's a trip to Mars, man. And don't quote me. But I think it might all be about learning how to be cool about living and not worrying so much about dying. Again. Don't quote me. Recommended If You Like: good songs. File Under: the finely aged one-of-a-kind walnut console that hold all your most previous vinyl.